A Portrait of Amida (Amitabha) strongly aware of India by a nihonga (Japanese-style painting) artist renowned for his Buddhist paintings. Amida (Amitabha) is seated on a lotus seat with its fingers forming a circle to indicate a raigo-in (reasoning mudra). Kneeling on the left are Kannon offering a lotus base to put the spirits of the dead on and Mahasthamaprapta with its hands together in prayer. Around them, there are bodhisattvas playing musical instruments such as the sho (wind instrument) or biwa (lute) and those scattering lotus petals. Brilliantly depicted here is the scene of Amida Buddha coming from the Western Pure Land Paradise to welcome the spirits of the dead. Following the wish to go to the Pure Land, many pictures of the descent of Amida have been depicted from old times. Among them, by painting Amida’s skin brown, covering the shoulders with a thin garment in a Western region-style, and dressing the bodhisattvas in old-time clothes resembling the Indian nobility, Hirokata makes us strongly aware of India. Three years after painting this work, invited by the great Indian poet Rabindranath Tagore, the artist went to India. 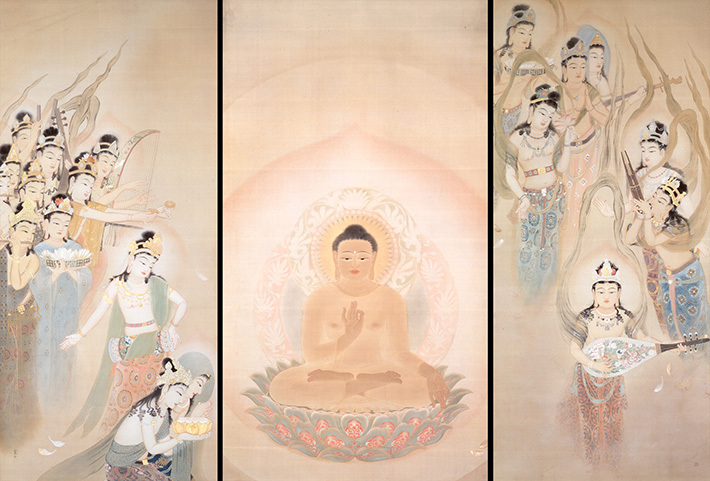 The center portrait of Amida was submitted to The Seventh Bunten (Ministry of Education Art Exhibition) in 1913 as The Coming of Amida Buddha to Welcome the Spirits of the Dead.